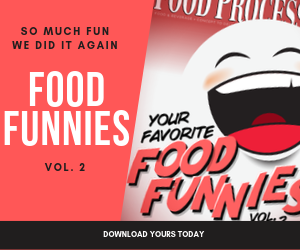 June edition of Food Processing's Food Funnies, a monthly feature guaranteed to give you a good laugh. Congratulations to Brian Surratt for the winning May Caption! ‎Is that garbage in, or garbage out? Hmmm…this isn't what I meant by "putting all one's apples in one basket." Where’s the beef?, and Where’s is my brain? I knew Amazon was getting into groceries, but this is ridiculous. We need to re-think this recycling program. And I thought Gobstoppers™ were impressive! I'm wondering if this is not a violation of our allergen program? I guess this meets President Obama’s green initiative and the First Lady’s Obesity initiative at the same time all organic and no carbon footprint.